Edward (Ted) B. Diethrich (M.D. 1960), a pioneer in the treatment of heart disease and a founding member of the National Advisory Board for the U-M Samuel and Jean Frankel Cardiovascular Center (CVC), died Feb. 23, 2017. 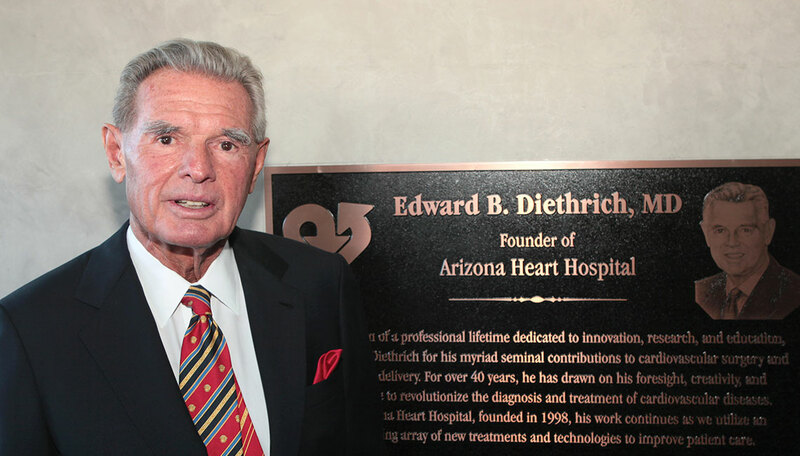 Diethrich served as medical director of the Arizona Heart Foundation and as a cardiothoracic/vascular surgeon at Arizona Heart Hospital, later establishing and directing the Arizona Heart Institute in 1971. Diethrich also founded the International Society of Endovascular Specialists, co-founded and served as co-editor of the Journal of Endovascular Surgery, and was an international ambassador for vascular and endovascular therapies. In 2015, the CVC established the Diethrich Professorship in Biomedical Engineering and Vascular Surgery. It was the first joint appointment funded by two schools at U-M — the Medical School and the College of Engineering — melding science and medical practice in the cardiovascular field. In his role on the National Advisory Board, Diethrich helped the CVC establish its mission of fostering multidisciplinary collaboration among clinicians and scientists in order to achieve superior, compassionate patient care; innovative science and discovery; and excellence in education. Courtesy of Traci Fischer of the Samuel and Jean Frankel Cardiovascular Center.